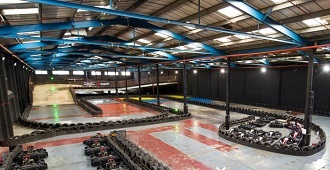 An excellent go kart circuit located close to Brighton in West Sussex. This 450m track has everything including multi-levels, banked corners and a flyover so you won't be disappointed with this venue! It also has great facilities such as catering and a bar and the conference room means that it is ideal for corporate groups looking for something a bit different. Head southwest on the A27 and at the first roundabout take the first exit onto the A2025/Grinstead Lane. At the end of the road, at the roundabout take the third exit on to the A259/Brighton Road and at the first set of traffic lights turn right onto Western Road. Take the first right onto Winston Road and follow the one way system round to left onto Marlborough Road. After 100m take the first right onto Chartwell Road • After 100m take the first right off Chartwell Road (restricted usage road), the circuit is located at the end of this lane on the left.